Many Massachusetts homes have experienced flooding this month, so we're all a bit focused on plumbing. I've had two plumbing issues recently, both involving interesting technology fixes. I live in a 100 year old house with fragile plumbing and electrical infrastructure. Recently, the plumbing on two old pedestal bathroom sinks clogged to the point that no plunger or drain cleaner could clear them. In an old New England house, the bathroom sinks are often plumbed back to back together, making a plumbing snake impossible to use. The only option is to open the wall and replace the offending pipe…or so I thought until I discovered Kinetic Water Ram technology. The idea is simple - use compressed air to create a shock wave of moving water at 5000 psi. The wave moves inside the pipe, not against the pipe walls, so it will not burst the plumbing. These devices are used by plumbers to clear very challenging clogs. Typically a plumber bills $150 for a visit. For $250, you can purchase one of your own. Here's a video of how it is used. The great news - I'll never need to use chemical drain cleaners or a plunger again. One device clears bathtubs, sinks, toilets etc. Clogs and accumulated corrosion deposits are both cured with a shock wave of water. My wife and daughter thanked the home CIO for solving the problem. In the recent floods, hundreds of basements in the Boston Metrowest area were flooded and damaged. Although my basement survived without damage, I realized that our 20 year old sump pump was a single point of failure. If the sump pump failed, we'd be flooded. If the electricity failed during a storm, we'd be flooded. Hence I investigated "disaster recovery" hardware for basements. I found the Wayne battery backup sump pump. Last weekend, I replaced our 20 year old sump pump with a new pedestal pump and discharge hose. This weekend, I'll add the disaster recovery system. The end result will be a 2300 gallon per hour primary pump with a 2300 gallon per hour battery backup pump that should last for a day of pumping with a 75 amp battery. Thus, I'll be covered for pump failure and power failure. The home CIO does for the basement what the work CIO does for the data center. I'm also a big fan of using enzymatic drain cleaners once a month in the sinks, shower, and toilet. It fixes many of with slow drains, is safe to handle, and has a much lower environmental impact than its chemical counterparts. Plus a jar of it will last you well over a year for a small amount of money. Its not the right tool for a clogged drain but it can help to avoid them entirely. Just to let your readers know, there is a much cheaper tool they can get from their home improvement store. It's called the Kleer Drain and costs only $30. 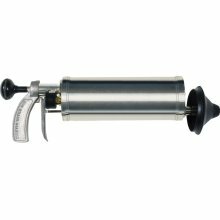 It's similar to your Water Ram, but instead of pumping by hand, it uses CO2 cartridges that sell for $1.50 each (you get a set of 4 included with the tool). I've cleared 3 clogs with this handy tool (takes 1-3 cartridges per clog, depending on how bad the clog is). You can use the Kleer Drain 50 times and it would still cost less than the Water Ram. This was my favorite health IT post of the week. Thanks for sharing. Great idea to have a back-up pump on battery backup.